Friday dinner (7pm) to Sunday before dinner. Sunday dinner (7pm) to Wednesday before dinner. Thursday dinner (7pm) to Monday after party. This non-residential course is designed for all levels from the absolute beginner to the professional dancer and concentrates on the technique, presentation & notation of Baroque dance. It allows students to immerse themselves in a number of skills associated with Baroque dance that are usually not possible to cover during a weekend course or series of evening classes. Modules may be attended independently and participants may enrol for one, two or three modules, or on a part-time basis. Focusing on a sound technical foundation, this intensive course equips newcomers to Baroque dance with a thorough grounding in basic skills and provides the more experienced dancer with the opportunity for further in-depth study on various aspects of Baroque dance. The Rubicon Centre has two dance studios with sprung floors and wall-length mirrors, a study room, café area, and changing and shower facilities. Dinner is provided on-site most evenings, lunch is not provided but there are many local shops selling a variety of produce very close to the Rubicon Centre. Classes run daily from 9:30am to 9:30pm unless otherwise stated, and are accompanied by recorded music or musicians on period instruments. Mornings: Two technique classes with different level mixes to allow for consolidation and challenge. Choreographing in Style: combines technique, presentation, choreographic forms and notation, reading & reconstruction from 18th century notations and Baroque style dances choreographed by Philippa, enabling participants to concentrate on the technique required to attain movement qualities for dances such as sarabande, bourée, gigue, menuet etc. Performance skills: including musicality, use of arms & head as a means of expression, etc. Other workshop examples: Mechanics of Arm Motions, Baroque Gesture, Character Dance, Commedia & Mask Work. 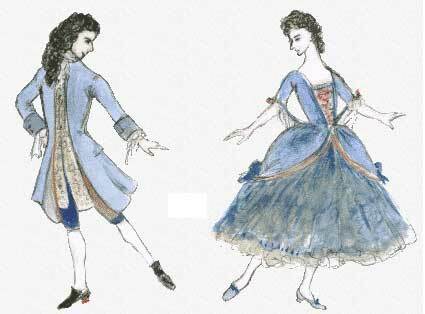 Evenings: Workshops/Lecture-Demonstrations on various aspects of Baroque dance. Free Time: Thursday, August 22nd is a free day to explore Cardiff and surrounding areas. There will be shorter periods of free time available for those only attending one module. The course will end with an All Periods Dance Party and Buffet. Period costumes optional. Tickets: £20 (course member not attending Module 3); £25 (non-course members); £40 couples (non-course members).